Paint the walls a striking feature colour, then add some black into the mix with the traditional white for this monochrome + feature colour look. Be sure to pick up the stomach-churning zig-zagged shower curtain for the full effect. Plain white tiles are almost always a terrible idea. They’re impossible to keep clean and the grout lines are a disaster. On the other hand, a mixed palette of whites with a grey grout adds texture and depth (and are much more forgiving if you haven’t busted out the Jif for a few days). To complete the look, throw in a recently sawn stump and scrubbing brush with an extra long back-reachable handle. You’ll be forgiven for thinking you’re at a glamourous day-spa as you pop on your slippers. Japanese-style bath combined with a scenic vista makes this little nook a bath-time to remember. Oh, and look, sushi included! 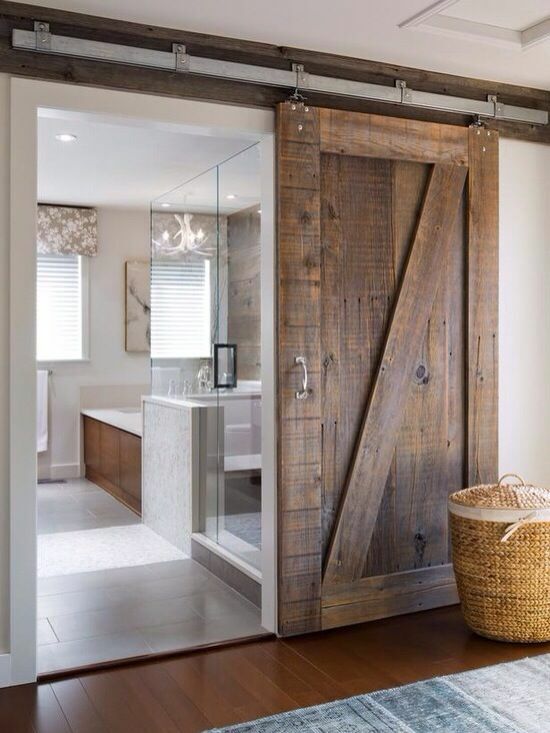 What room couldn’t be improved with a full-height barn-style door? I’m stumped. 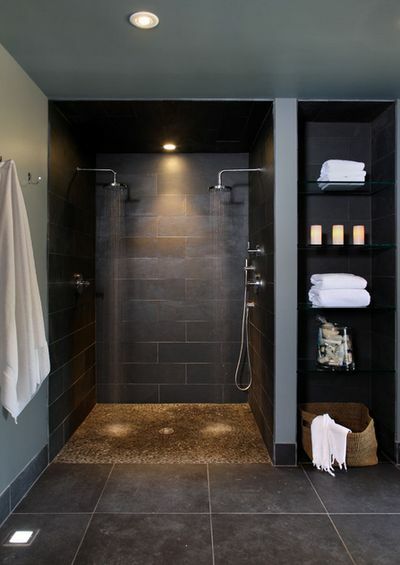 Dark, earthy browns create the perfect retreat in this shower-for-two. Glossy, rough, painted surfaces combined with high-gloss tiles and sleek fixtures makes this shabby/industrial chic bathroom look incredible. There is nothing that hasn’t been improved by the addition of a chandelier. 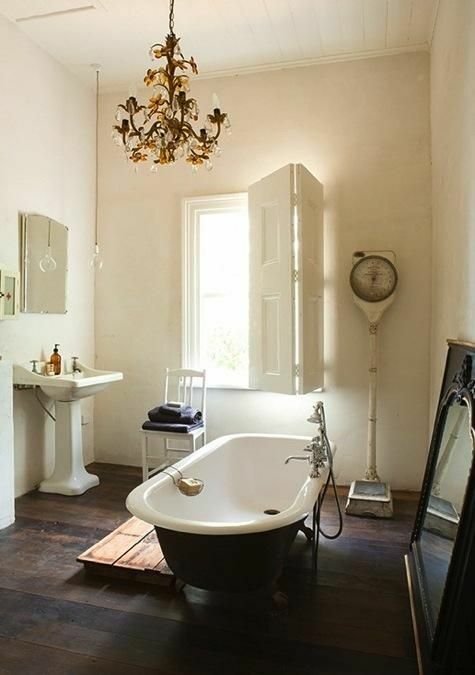 And, if you have a period home, don’t try to fight against it by installing a clean, shiny, modern (boring) bathroom. Work with it. 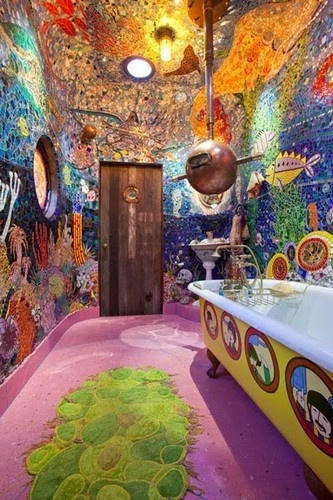 Stick a giant claw-foot tub in the middle, nonchalantly add oversized mirrors and vintage coin-operated scales and you have yourself a prize-worthy place to take care of your daily ablutions. Have a beach home? Or have a brain-dead job where you can cruise in on holiday time? 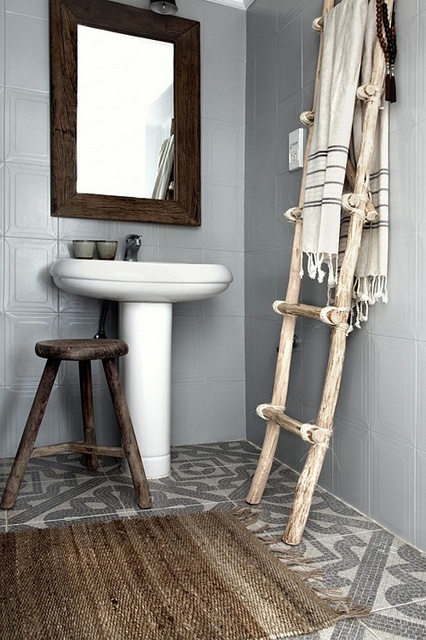 Bring the beach to your bathroom with sisal, linen and driftwood accents. 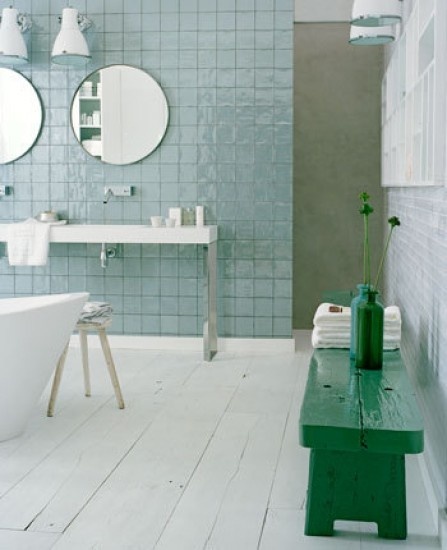 The textural wall-tile and patterned mosaic floor cement this bathroom as a care-free space. Funky is an annoying word. 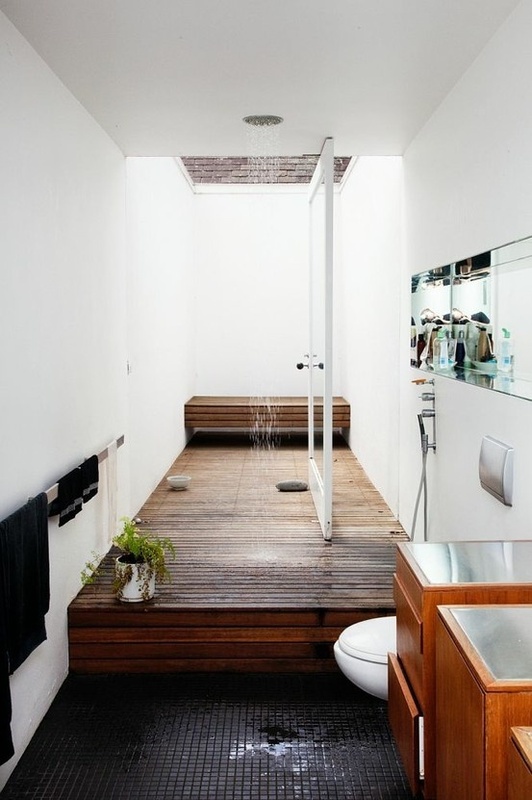 But it’s hard to find the appropriate word to describe this simple, but fun bathroom. 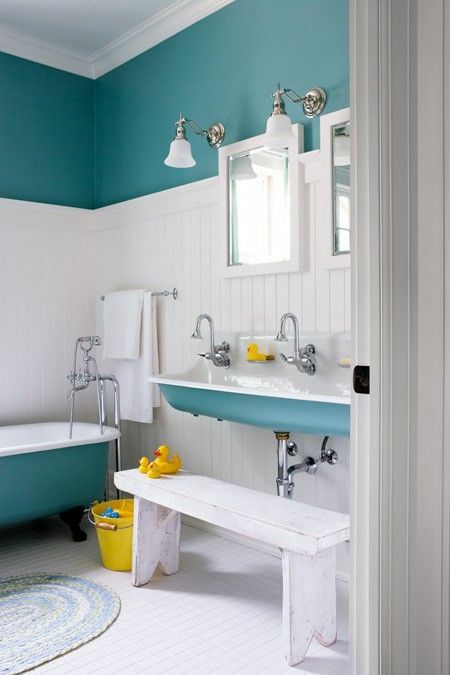 A plain, crisp, white bathroom can easily be ‘funked’ up (make sure your read that right) with a vibrant splash of green. 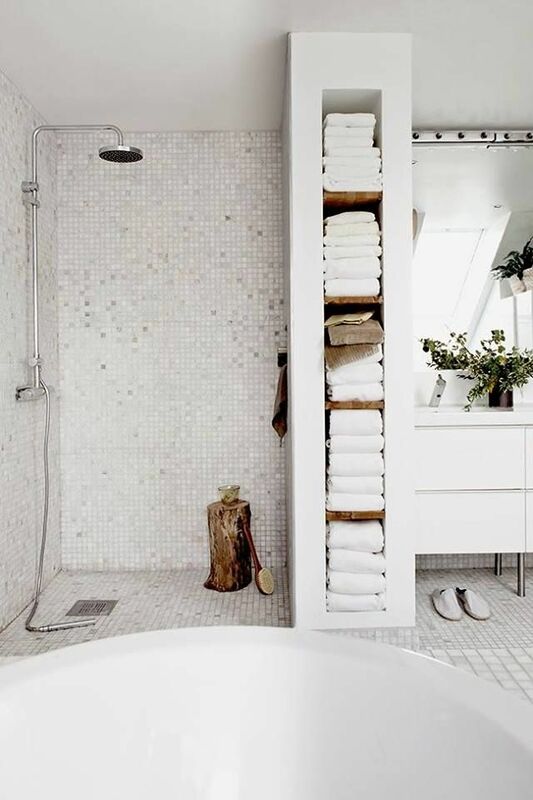 The random glass tiles are easy to insert even in an existing bathroom and the shower curtain can be picked up for approximately $2 from IKEA (and a hot dog) but instantly lifts the space. The pièce de résistance? That sparkly chandelier! 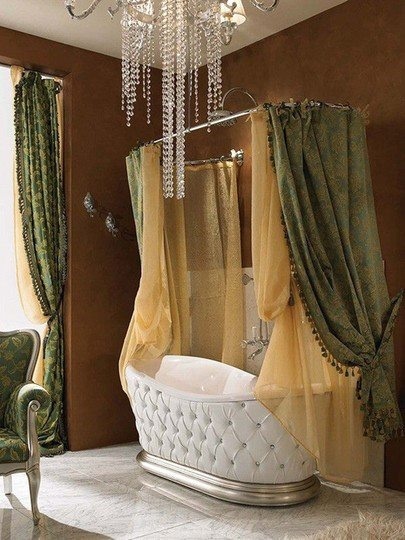 I’ve said it before (approximately 2 bathrooms ago), I’ll probably say it again when the next bathroom with a chandelier rolls around. Chandeliers are classy as hell. Some people try to approximate it by putting a Bunnings bath under the shower. But this. Well this is a work of art. Probably more suited for a day spa than a home, but nonetheless it’s impressive. We also love the dotty tiles. Oh, I think we’ve seen this before. It’s a pretty easy to achieve look. 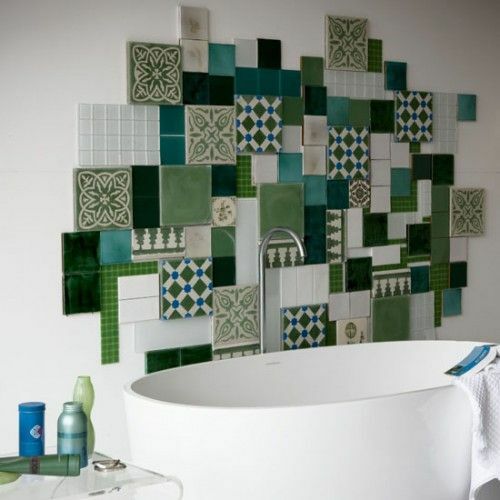 All you need is a mismatch of tiles in cohesive shades and a bit of time on your hands. Better yet, let one of our tilers do the job for you – it’s probably better for the nerves. Sculptural stand-alone bath not included. 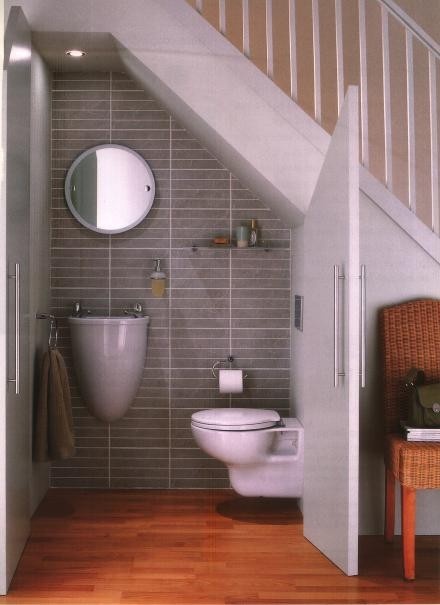 Got a spare space under the stair? Why not stick a super handy hidden powder room under there? 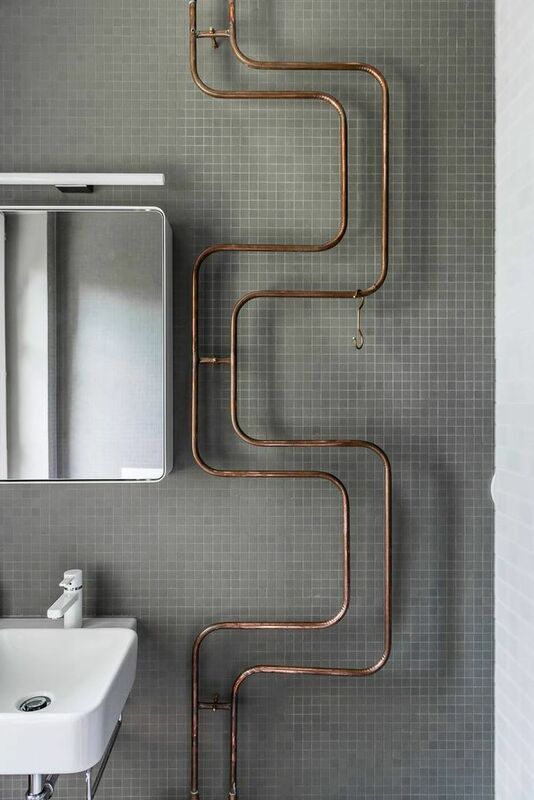 Our talented and charming plumbers, tilers and renovators would be happy to help you turn Harry’s old bedroom into a fully-functional bathroom that’s a lot closer to the couch. Nothing livens up a space like mirrors. They add depth and create a sense of space. And while one mirror will get the job done, twenty-three mirrors would be better. There are a lot of unloved frames sitting in garages and Op Shops all over Australia. 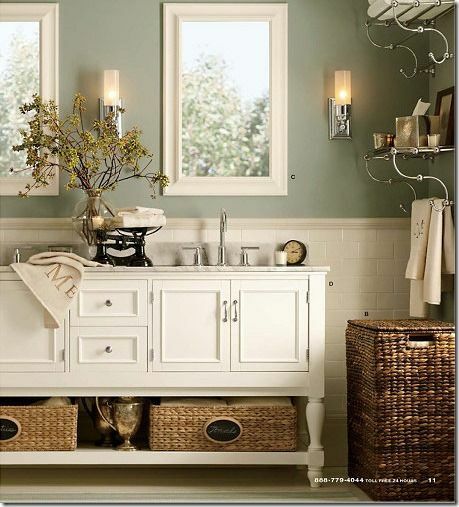 Put some mirror in them (our glaziers can help you out) and create a more… reflective bathroom. 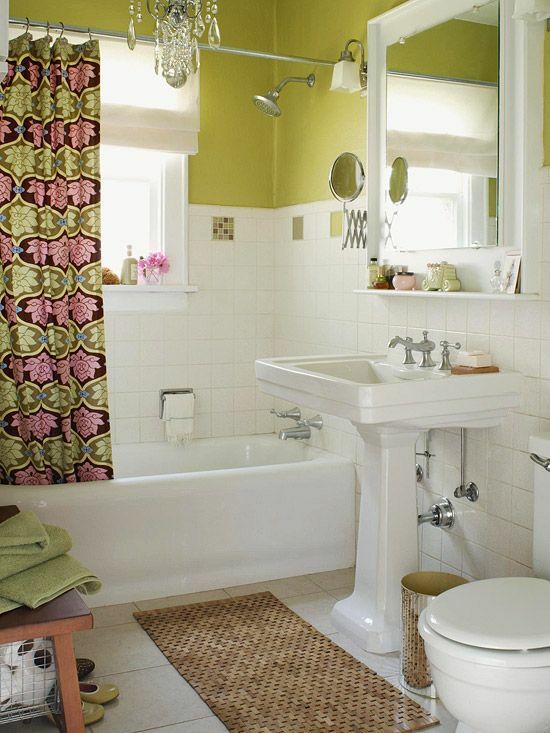 Bathrooms can be tough to redecorate because you can’t just paint basins, baths and tiles. 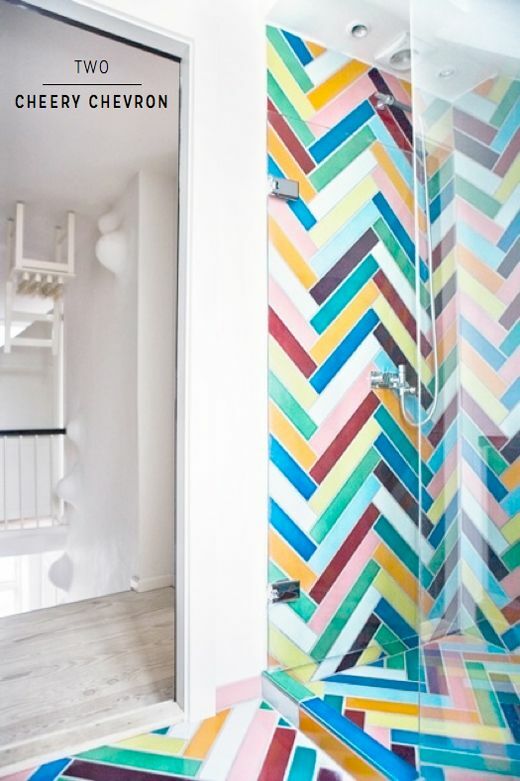 So here is a good way to bring some colour into the bathroom, that you could also update over time without ripping everything out and starting from scratch. Granted, you’ll have to get your hands on some delightfully antique fixtures like these (try a demolition company, the trading post, etc.). But once you do, you can have accents in teal (like this), sunshine yellow, rainforest green, or mission brown (don’t tell me that’s not going to come into fashion again soon). Orchids love the moist, humid bathroom environment. Coincidentally mold also loves the same conditions, but orchids are a much prettier form of plant-life. 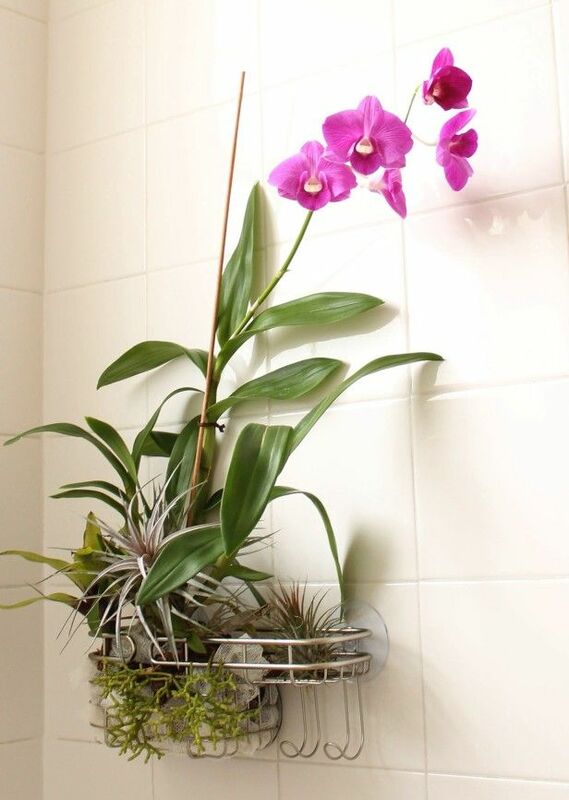 Orchids are also essentially air plants, and that’s why this suction-capped shower caddy arrangement works so well. 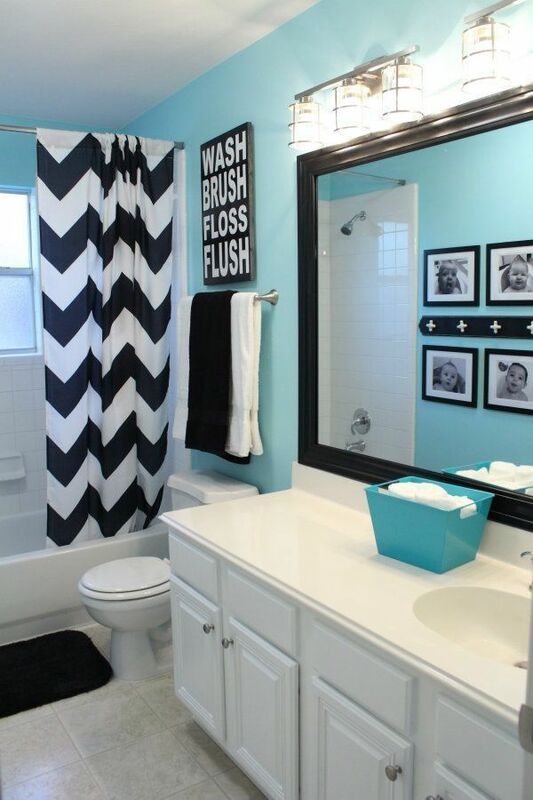 Now there’s a simple DIY project to brighten up the bathroom, if I’ve ever seen one. Classic combination here that will never fail to look stylish. 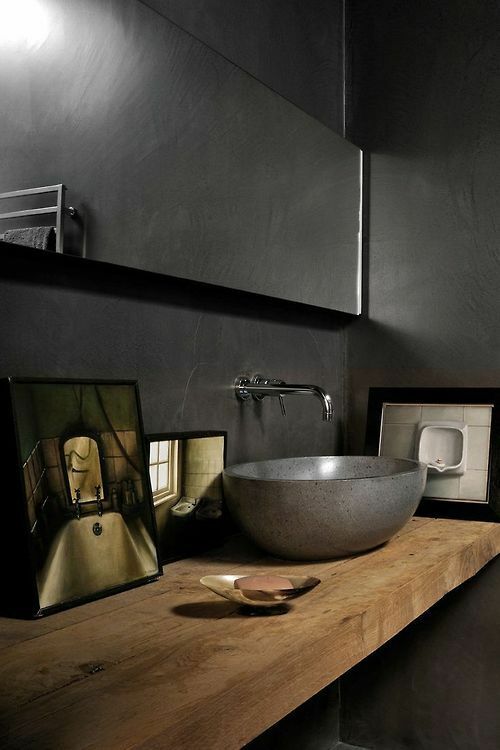 To complete the look it is essential to have oil-painted portraits of other parts of the bathroom. You know, so you don’t forget where you are and crack a bottle of red wine. 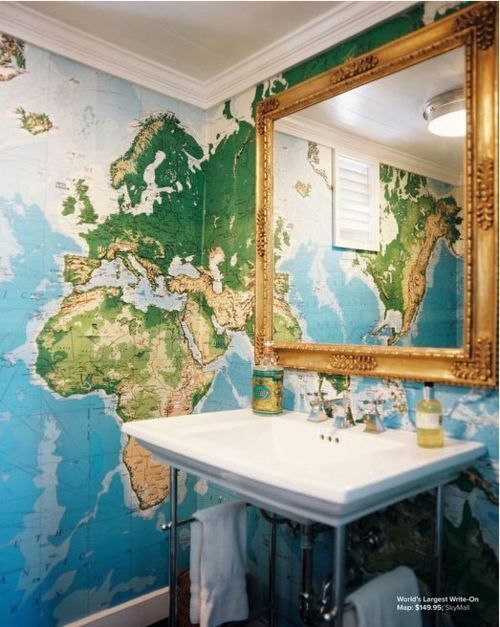 The kids will get straight As in geography after you install a full-height world map in their bathroom. You can make teeth-brushing time fun by insisting they need to keep brushing until they locate Turkmenistan. Maybe I’m being pedantic, but I’m pretty sure all those soft furnishings would end up mildewy before the end of the first bath. Fine if you have a staff on hand to dry clean the drapes after every soak, but otherwise I’m deeming this glamourous (note the chandelier), but completely, ridiculously impractical. Sorry to ruin your fun. We love a good feature tile, and this one is done particularly well – see the way it continues up the wall in the reflection of the mirror? Simple, stylish and unusual enough not to be boring. I don’t think I’ve overstated it in the title. 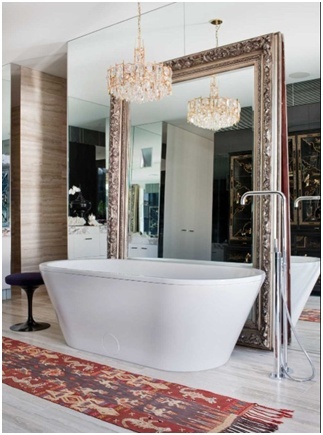 Combine an ridiculously oversized mirror with the elegance of a chandelier and you have yourself a game winning bathroom. Not for the self-conscious, though. If you have a peeping-tom free view over Mallee scrub (or something similar), then you should be putting it to good use. Those poor people in the city can’t even put clear glass in the bathroom without scaring the neighbours. So if you have the freedom, wake up with the wildlife by inserting a full-length glass window like this one. Bonus points if you include the slatted timber shower base, timber veneer feature wall and sculptural fixtures. If you’re going to use colour, use it everywhere! 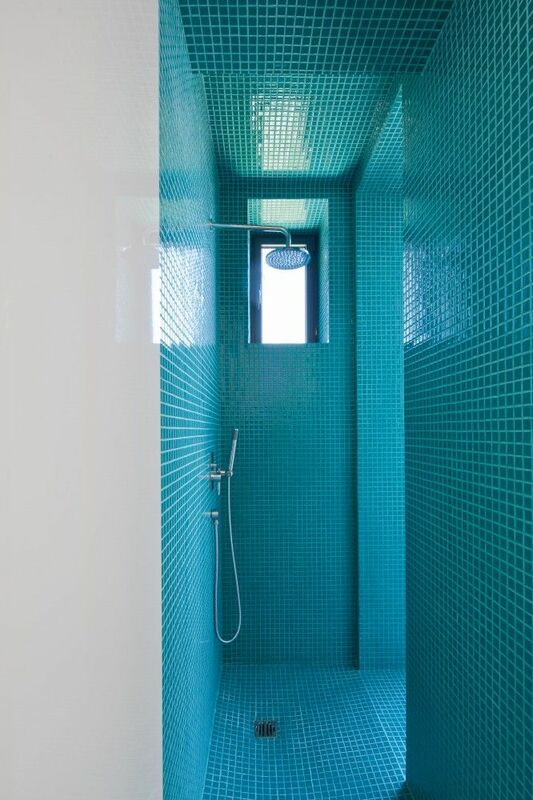 These gorgeous blue tiles wrap over ever surface of this bathroom, creating a very unique bathing experience. It’s fun, too. 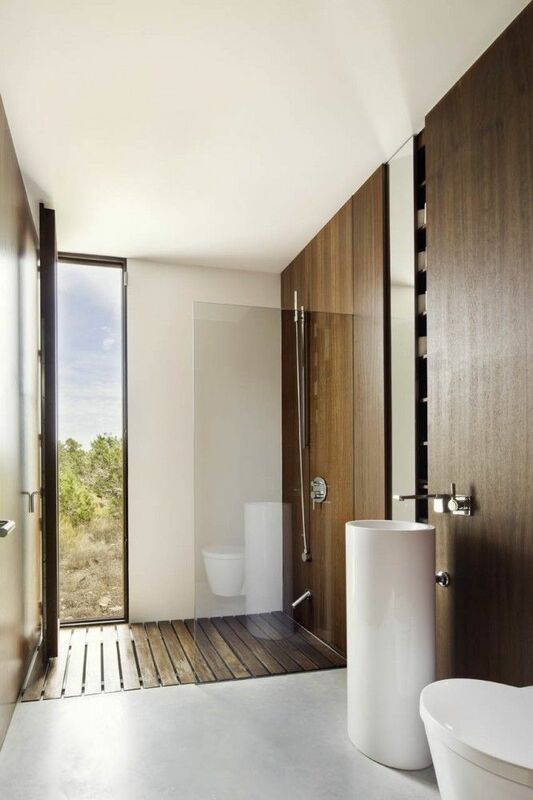 This full width pivot door opens the bathroom completely to the outdoors. This is a way to shower with nature without risking frost-bite in winter. Just imagine showering here on a warm summer’s morning. Spectacular. The rich timber joinery is stunning in this bathroom. One of our cabinet makers/joiners can create something this special for your bathroom. 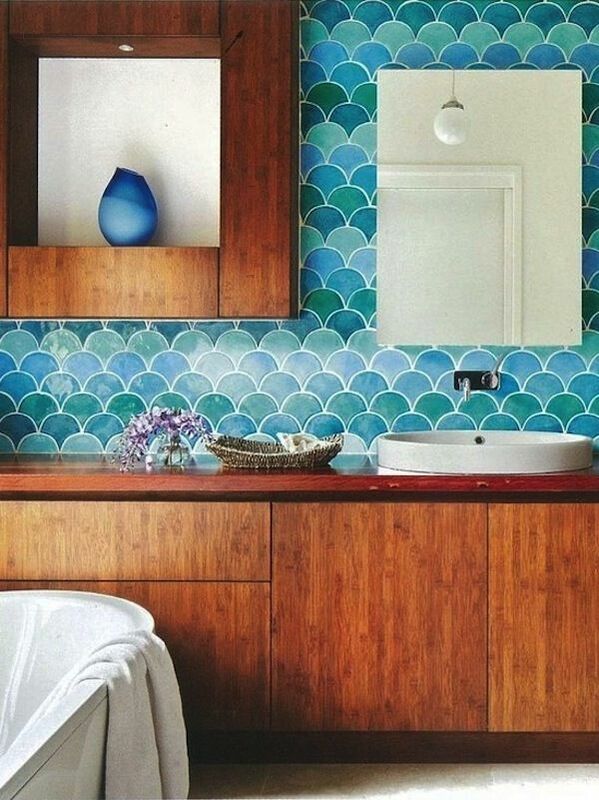 Just don’t forget the distinctive, multi-toned tiles that complete the look. If all else fails: Colour. Preferably in chevron format.